Where I live in Cornwall, it's a land of legends, saints, holy wells and other mysteries. I came across the picture above and remembered that I hadn't visited Menacuddle for ages. It's a place that is not on the main tourist route so it's virtually unknown to most visitors to the area. The Well Chapel is a housing for a Holy Well and dates back to the 15th Century - though no doubt the healing powers of the water were known long before the small chapel was ever built. The Well isn't sign posted but if going by car take the Bodmin Road from St.Austell town. It's only a few minutes drive but is hidden away secretly. Look out for the Elderly People road sign (see below) and the track is on the left just after this. Go slow, it's easy to drive past. Follow the track and there is a place to park a couple of cars. In saying that I have never seen anyone else at the well whenever I have made a visit. On the right is a river with a waterfall. The water is often a milky white colour, especially after rain, when it is coloured by the local china clay. A little further and the Druid's Chair rock will be seen. It's quite comfortable - for a rock, that is! Across the river can be seen the Holy Well Chapel. The river looked quite white on my visit today. A little further along the river is a small bridge so that you can walk back to visit the Holy Well. 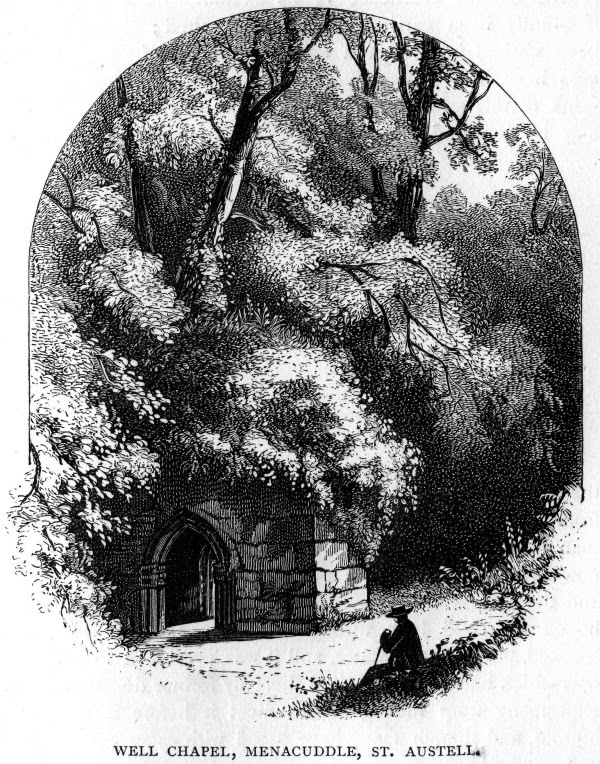 A Gothic archway leads inside and to the clear water of the spring. The building itself, other than the roof, is made of local granite. It's quite dark and damp inside. There is a local tale which suggests that visitors should drop a 'crooked pin' into the spring waters to ensure good fortune. It is said that on doing so this will cause pins thrown in by other pilgrims will rise to the top. In saying this today's visitors tend to prefer to light a small candle and leave this to burn in one of the recesses. And you might even see a strange animal lurking as well! The Holy spring water was once held in high regard for its curative powers. Sick children were regularly bathed here, and the Victorians recommend the drinking of its salubrious fluid. It was also used to treat ulcers. Personally I just dabbed my face with the clear water and made a 'good health' wish. ... as are the stone walls nearby. There it is, the secret Holy Well of Menacuddle. The pilgrimage worked wonders for me! Looks a magic place to visit. I must get to Cornwall again soon. Lovely photos as usual. Love the Cornwall tours! This place seems very mysterious! I liked it because no one else was about, so could take it all in properly.